When Tim Fiala moved to Hinton, IA earlier this year to serve as terminal manager for Floyd Valley Grain LLC (712-947- 4212), he was already familiar with CompuWeigh bulk weigh loadout systems from previous jobs at elevators in Iowa and Nebraska. If it were my decision, I personally wouldn’t use anything else, he says about the Woodbury, CT based manufacturer (203-262-9400). The terminal, currently under construction and scheduled for completion around July 1 is a joint venture between Farmers Cooperative Co. in Hinton and Ag Processing Inc. (AGP), Omaha, NE. 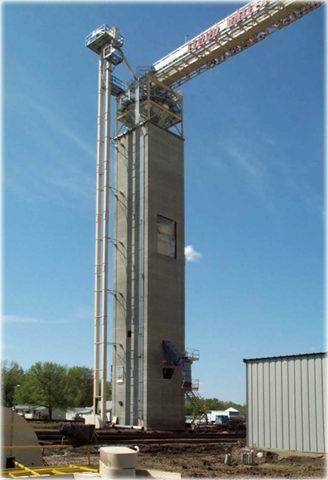 The 60,000-bph bulk weigh scale is housed in a 140-foot-tall slip form concrete tower, between two tracks. When completed, the system will be able to load 110-car unit trains through spouts on opposite sides of the tower. Previously, the local elevator loaded 54-car half trains, utilizing an old 20,000-bph bulk weigh scale that was just worn out. 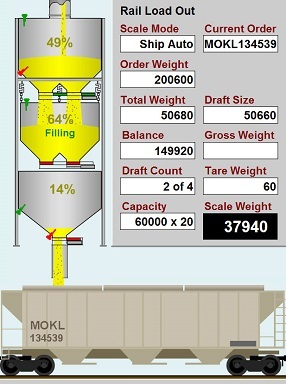 Fiala notes that the scale is equipped with CompuWeigh’s GMS-4000 software, which utilizes an RF tag reader and a national railcar database to automatically calculate the correct weight for each car. Look for more in-depth coverage of this project in a future issue.